The Asterisk War Episode 15: Mini Saya! The Li Twins Attack! 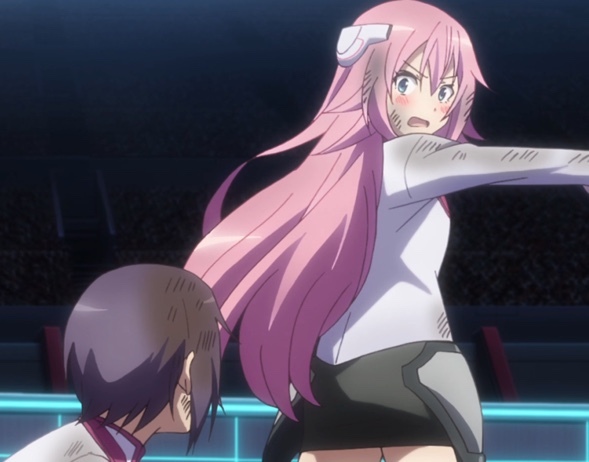 “Breaking the Memory Barrier,” the fifteen episode in The Asterisk War, shows us what happened when Sasamiya Saya and Amagiri Ayato tried to tag team Amagiri Haruka when they were younger. Plus, Li Shenhua and Li Shenyun begin their match against Ayato and Julis Riessfeld. Turns out the twin’s reputation was well-deserved! Even when they were kids, Saya supported Ayato. Capture from the Crunchyroll stream. Ayato remembers when his sister Haruka taught him how to wield a sword. Saya would watch the two of the them from a tree. She and Ayato would have little contests to win “favor cards.” Ayato had lost one to Saya, who demanded that he shout out the sword technique that he was about to use on his sister. 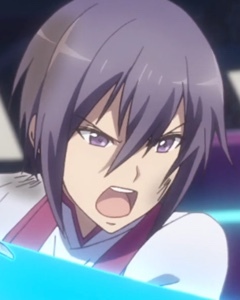 When he yelled “Amagiri Shinmei Style First Sword… Twin Dragons,” Haruka just sidestepped his attack and disarmed him. 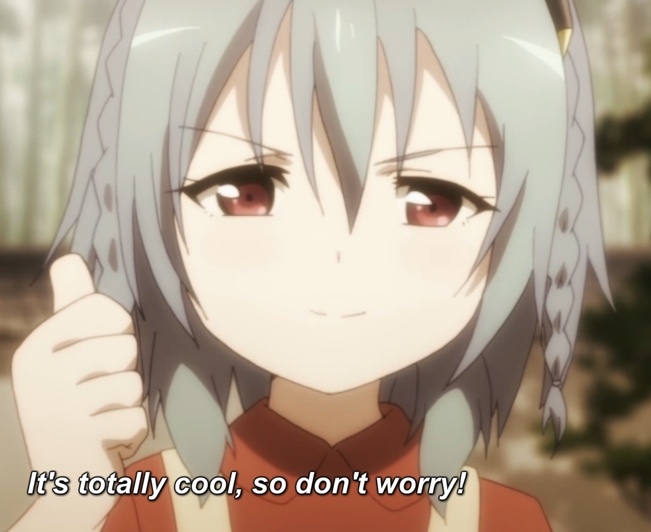 But Saya loved it. Saya owed him one favor, too, and he asked her to help him defeat his sister in a practice match. Their teamwork was excellent, and they actually made Haruka use a move she hadn’t intended on using. In the end, though, she defeated both of them. Ayato remembered this scene during a practice session with Julie, who could tell that he was distracted. The weight of Dirk Eberwein’s disclosure last episode (that Haruka has lost the Eclipse Festa match) weighed heavily on him, and Julis wonders if he’s afraid his sister has abandoned him. Julis sees that she can’t help, so she does the unthinkable: she asks Saya to talk to him. Of course, Saya can’t just knock on Ayato’s door: she hangs upside down outside his apartment window and knocks. Inside, she asks if Ayato really thinks that Haruka discarded him. When he hesitates, she grabs both sides of his face, calls him a dummy, and says that “Big Sis Haru” would never do such a thing. She then chides him for wasting time, and strangely enough, he feels energized and focused again. They agree that they need to find Haruka and challenge to her to another match. She leaves after reminding him he can rely on his friends. His mind back in the game, Ayato is able to help Julis prepare for the upcoming match with Li Shenhua and Li Shenyun from Jie Long Seventh Institute. Julis suggests they bait the twins using Ayato’s obvious flaw — he can only fight for so long before his sister’s enchantment binds his power. The twins preface the match with their usual condescending trash talk. Julis and Ayato remain civil. Ayato unleashes his full strength as soon as the match starts. He and Julis try to go on the offensive, but the twins counter with a strange smoke screen. This screen gave the twins the cover they needed to seed their invisible talismans around the arena. The smoke dissipates after a minute, but that’s 20% of Ayato’s full-power time limit. He attacks Shenyun, who creates shadow clones. He has to waste precious time defeating each. Meanwhile, Shenhua uses camouflage to ambush Julis. Soon, both Julis and Ayato are pretty beat up. Julis sends Ayato after Shenyun, and he slashes all of the shadow clones, just as his power gives out. The chains visibly bind Ayato, just as the crowd and the Li twins expected. Shenyun gloats over Ayato, who was counting on that moment. Summoning the seeming last of his strength, he slashed her badge. Unfortunately, he found that he had just slashed another shadow clone, and that the real Shenyun had been camouflaged since the smoke. She unleashes a devastating attack and slams him to the ground. Just before she finishes him off, Julis flies in using the same flame wings that she used in the first season and carries him to the other side of the arena. She, like Saya earlier, reminds him that he can rely on his friends, and that it’s her turn to protect him. Ayato didn’t want to give up even after taking a sound beating. Capture from the Crunchyroll stream. Somehow, that reminds him of the fight he and Saya had tried to wage against Haruka. He thanks Julis for helping him awaken. At first glance, Saya is almost a stoic. As I’m learning, though, she’s anything but. She has a subtle sense of humor, and she is direct and honest. Only she could have so thoroughly squashed Ayato’s budding fear that Haruka had abandoned him. And her entrance was hilarious! Hanging upside down was funny enough, but she immediately asked him to help her down. The scene between Saya and Ayato was an emotional high point for me, at least so far in the second season. Two friends who had known each other since childhood, sitting beside each other, talking about things that matter to them — moments like this keep me attached to this show. Even when they were younger, Ayato and Saya were good friends. They put up a good fight against Haruka, and they only lost because her skills were just far beyond theirs. I also liked how Haruka didn’t talk down to them; she seemed to earnestly want to teach both of them, Ayato in particular. I wonder if she was training them for the sake of training, or did she have some inkling about his future? So, Shenyun uses shadow clones. I wonder if she studied with Naruto? Julis and Ayato continue to fight well together. Usually, the male character is all ego and bluster; Ayato’s more level-headed and calculating. He also trusts his partner, and she trusts him. That’s another one of the things I enjoy about this series. Julis didn’t quite know what to make of Ayato when he said “thank you” in the middle of combat. Capture from the Crunchyroll stream. If Julis telling Ayato he can rely on her to protect him sometimes was all it took to unbind his powers, I’m going to be really disappointed. It almost felt like someone set off an anticlimax bomb! I hope the plot listens to comments like the one Londeyr left on Crunchyroll’s site under the episode: “Seems pretty obvious to me: flashback where his sister used an ability apparently designed to turn two targets’ attacks against one another despite great teamwork? Gee, that’s not relevant at all to this battle…” That would be way more dramatic, and it wouldn’t involve breaking the seal Haruka placed on him. This episode had some enjoyable character scenes, like the flashback to Saya and Ayato trying to defeat Haruka in a practice match. I also really enjoyed the scene between Saya and Ayato in his room. Like similar scenes in previous episodes, their emotions seemed realistic and mature; he didn’t develop a nosebleed because she asked him to sit beside her, and he didn’t get all wide-eyed and nervous when she grabbed the sides of his face. They just seemed like two dear friends talking. I think these scenes make such an impression on me because they’re so rare, at least in the shows I watch! Next episode should show us how Julis and Ayato defeat the Li twins. At least, I hope that’s what it shows! I would certainly like to see the twin’s condescension taken down a notch or six!